The origins of the Italian Hound go back to antiquity. They are certainly descended from the ancient hounds of Egypt that were used for hunting. They have been maintained practically without change through the centuries. 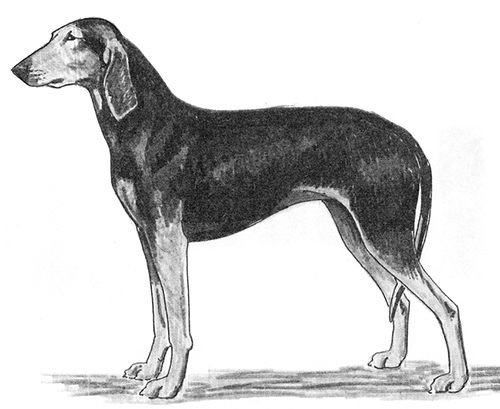 The Italian Hound was recognized by the United Kennel Club in 2006. The Italian Hound is a square breed of medium proportions, robust and well balanced with strong, lean bones and no trace of fat. It comes in two coat types - rough and smooth. The Italian Hound is perfectly adapted to working on varied terrains. He hunts alone or in a pack, and is endowed with great resistance and good speed. The breed has a hearty temperament and a soft expression. The rough coated variety tends to be more reserved than the smooth coated. The skull is nearly oval in shape when viewed from above. In profile, the top lines of the skull and muzzle are divergent. The stop is slightly marked by a soft slope. Disqualification: Parallel planes of the top skull and muzzle. The muzzle is as long as the skull. It is deep and slightly convex (Roman nose). The lips are fine and thin. They are fairly tight and in profile the upper lip shows a slight curve. The edges of the lips are always black. The cheeks are fairly flat and lean. The Italian Hound has a complete set of evenly spaced, white teeth meeting in a scissors or level bite. Large, mobile, and always black. The eyes are large and luminous, open almond in shape, and dark ochre in color. The expression is soft, and the eye rims are always black. The ears are triangular in shape, flat, and very broad. They end in a narrow point. The ears should be long enough to reach midway to the end of the muzzle. The neck is long, lean, light and slightly arched. There is no dewlap. The shoulder blades and upper arms are long and sloping, covered with lean muscles, and join together at an angle of approximately 110 degrees. The forearm is straight, dry and thin. The carpal joint is dry and covered with fine, thin skin. The pasterns are somewhat sloping. The body is square. The depth of the chest is equal to half the height at the withers. The chest must reach to, or nearly to, the elbows. The chest is only moderately wide and the ribs are lightly sprung. The withers fuse harmoniously into the base of the neck, due to the closeness of the tips of the shoulder blades. The back is straight and the loin is about the same length as width. The croup is slightly convex, with well developed muscles. The underline is straight, and then ascends to the belly, which is very lean, even if not very tucked up. The angulation of the pelvis and the femur is approximately 90 to 95 percent. The upper thigh is long and wide and covered with prominent, clearly separated muscles. The angulation at the stifle is about 115 percent. The lower thigh is slightly shorter than the upper thigh, and is light but solid with lean, distinct muscles. The hock joint is solid, with a clearly visible outline, and the rear pasterns are perpendicular to the ground. Oval shaped, hare foot, with tightly close, well arched toes. The pads are dry, hard and leathery, always black. The tail is set high on the line of the croup. It is thin at the base and uniform in size except for the tip, which is very fine. The tip should reach to, or nearly to, the hock joint. At rest, the tail hangs. In action, it is raised above the backline. Smooth - Short, straight, smooth horse textured hair all over the body. There may be a few scattered short hairs on the face or body. Rough - On the body, the hair should not be more than two inches long. The hair is rough, though it may be smoother on the ears, legs, tail and muzzle. The hair forms a moderate beard and eyebrows that do not cover the eyes. The acceptable colors are all shades of fawn (from intense red to faded), and black and tan. The fawn may have white on the muzzle and on the skull, a white star on the chest, white on the neck, pasterns, hocks, feet and tail. However, the white is not desirable and the less the better. In the black and tan dogs, the tan markings should be typically placed as in all black and tan dogs. They may also have a white star on the chest. Disqualifications: Any other color. Predominately white. Height at the withers for males is from 19.5 to 23.5 inches. For females, it is 19 to 23 inches. Weight is from 40 to 60 pounds. When hunting, the breed gallops. More than one inch over or under the prescribed sizes. Parallel planes of the top skull and muzzle.